Summer is the season for travel and exploring nature. What better way to do than in the comfort of your RV? You may be a little worried about the stifling summer heat. Your RV might be too hot to sleep comfortably? While this is a genuine concern for most, here’s a ready solution — installing the best RV air conditioner. RV air conditioners come in handy to regulate the temperature in your vehicle — keeping it cool enough while you enjoy your adventures. These air conditioners differ in shape, power draw and size. There are a few crucial factors to consider before you can settle on the best RV air conditioner. The purpose of this guide is to make this task much easier for you. First, let’s take a look at some of the RV A/C units on the market today. This air conditioner not only offers versatility when it comes to placement options, but it also boasts of superior performance. 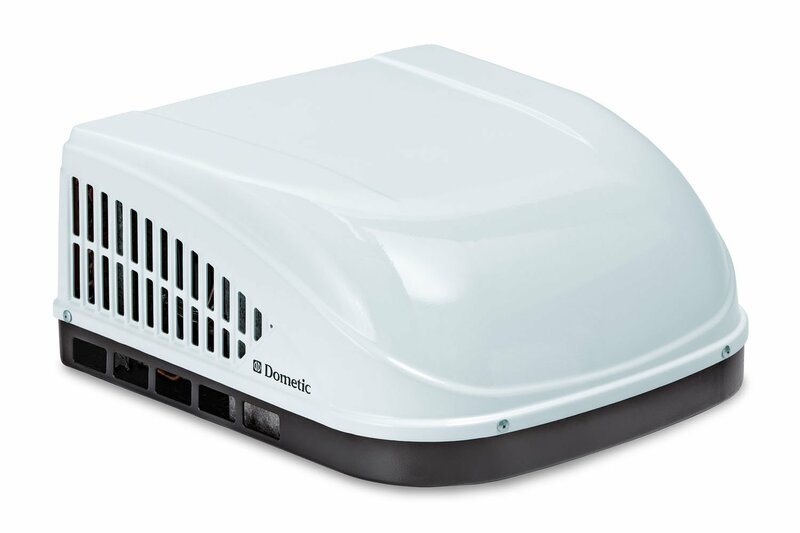 The Dometic Brisk II Polar RV air conditioner can be installed using both ducted and non-ducted methods. It is also space-friendly and light in weight. These features add to its versatility when it comes to placement options. It is 20% lighter than most RV A/C models while ensuring a higher level of airflow in comparison (15%). It gets its superior performance from its motor and fan. Also, it has an electrical rating of AC 115V, operates on a 60Hz frequency, has a BTU rating of 15000/hr, and makes use of a single phase source of power. This 29.2 inches long, 27.2 inches wide and 12.7 inches high air conditioner weighs about 75 pounds and can be used with a number of air vents, and it is easy to maintain. This air conditioner has been dubbed by its manufacturer as the most powerful in its niche. It has a great a power output as it has a power draw. It is fitted with ⅓ hp fan capable of achieving 325 cubic feet / minute of cooled air. It is also functional during the cold weather as it is fitted with a 5,600 BTU heater. Designed to be compatible with ducted systems. However, to make it compatible with a ductless system, just make use of an adapter. It stars the same sleek shape that magnifies the airflow and cooling performance of every model from the Coleman company. Exclusive copper tubing and high-quality joints guarantee long life and product reliability. Big evaporator and well-designed condenser coils improve the unit’s capacity to get rid of heat. Next, we have the Dometic Brisk Air II 13,500 BTU air conditioning system. Despite its BTU rating, this unit is rather powerful. It is designed to function effectively and give off cool air even when the outside weather is hot and sticky. No wonder, the company claims it to be a revolution in the RV A/C niche. It is a durable air conditioning unit. Manufacturers ensure its longevity by using aircraft-grade parts. The use of polypropylene makes it possible for this air conditioning unit to be both durable and light in weight. It also adds to its insulation and aerodynamic shape. The latter is effective when it comes to significantly reducing the unit’s drag. It promises to give 15% more cooling and enhanced air flow. When compared to other RV air conditioning units, the Brisk Air II is much quieter. This is due to the use of technology that works to minimize the unit’s vibrations when in use. The product also comes with a two-year warranty. 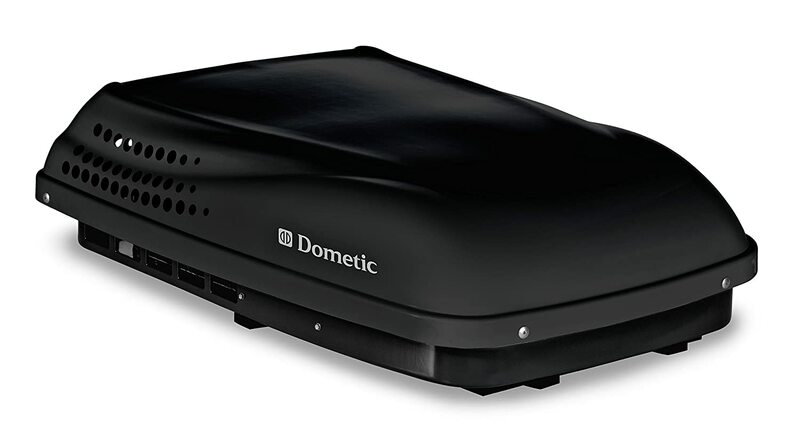 The Dometic 640315CXX1J0 Penguin II Low-profile 410-amp small RV Rooftop Air Conditioner is a well thought out unit in terms of design and functionality. It is designed to work well with both ducted and non-ducted systems. Fits all regular roof openings. It owes its high performance to its streamlined design that works to reduce drag as well as its powerful motor significantly. It makes use of the R410A refrigerant, that is eco-friendly, and a fan to give off that much needed cool air. It is both lightweight and built for durability. The manufacturers make use of a base pan that is rib-enforced to give the product its durable and sturdy features. Its comfort control is automated making its operation a walk in the park. While it is a great air conditioning unit for the RV, users do have to put up with the noise it makes when in operation. Air conditioning units are a necessary and versatile addition to any RV. They come in handy to not only cool the cabin of your motorhome, but few also can heat it up during the colder months. The best RV air conditioner will differ greatly as the needs of people are different and so are their tastes and preferences. However, the need to stay cool while enjoying the great outdoors in your RV is similar. We have already established the need to have an air conditioning unit in your RV. The question, however, what is the best RV air conditioner to buy? There are several factors to consider before spending your money on any air conditioning unit. Before we can look into the different considerations that you have to make when shopping for an air conditioner for your RV, it is important that you have an understanding of how it works in the first place. Many different parts that make up an RV air conditioner unit. Of importance is the unit’s compressor. The purpose of this component is to keep the air temperature in check. It does so by heating and cooling the vapor to maintain the room’s temperature. The air conditioning unit is powered by an AC power source, usually a generator. Before we take a closer look at these factors, let’s consider the different types of RV air conditioners that exist. Ducted Units: These make use of pipes to circulate cool air throughout your RV effectively. With such units, you can have pipes running through your walls, floors or even ceiling. Non-ducted Units: These are centralized units that provide cool air from the air conditioning unit to the room without the help of pipes. They incorporate blowers, compressors, and condensers. Under Bench Units: These units are designed to be fitted in compartments or under a bench in your RV. They come in handy when the parking space does not have a lot of head room or when you have other gadgets attached on top of your RV. The downside is that you have to part with a portion of your storage space when using these. Rooftop Units: The naming of these units is a dead giveaway to their ideal placement. They are either non-ducted or ducted. They come in handy when you need that extra storage space but may be counterproductive in that they make your RV taller and might limit your parking options. Portable Units: Last but not least we have portable units. They come either with or without vents and work by evaporating water to give off the much needed cooling effect. They are rather affordable and are great when you need localized cooling. The type of RV air conditioner to select is an important factor to consider. It is not, however, the only factor to consider. British Thermal Units Rating (BTU): These units determine your air conditioner’s capacity to effectively cool your RV. Generally, most RV air conditioners have a BTU of 13,500. This is sufficient for smaller class RVs. You will need an air conditioning unit that has a higher BTU for a larger RV. Consider using the 15,000 BTU unit for the larger class RVs. Also, if your adventures often lead you to warm areas, then a unit with a high BTU might be suitable for you. Size of The Unit: The size of your air conditioning unit has an implication on its power and fuel consumption. The rule of thumb here is that the larger the air conditioning unit, the greater the fuel consumption. Having this in mind will come in handy when budgeting for the total fuel necessary to power your air conditioning unit for the entire duration of your trip. The size of your air conditioning unit of choice will also have a direct implication on the amount of storage space available. This is especially so with under bench units that are situated on the inside of your RV. Size of Your Motor Home: When shopping for an air conditioning unit for your RV, it is prudent to match the size of the unit to the size of your RV. The smaller the RV, the smaller the size of air conditioner you will need. Ease of installation: Installation is an important part of having a fully functioning air conditioner. The spot of an RV A/C must be on the roof of the motorhome, s that when the temperature rises, it quickly takes it to distribute back cool air. The fixing of the RV A/C unit is comparable to the split AC.Here, keep an eye out for a unit that is accompanied by a user manual that includes installation instructions. Ease of Maintenance: When it comes to maintenance, the easier the better. An air conditioning unit that demands a lot in terms of maintenance will in the long run end up being cost and time ineffective. Consider The Brand: Here, old is gold. The longer a brand has been on the market the better it is at producing quality products. Also, keep an eye out for brands that specialize in camping equipment. Products from such brands are designed to enhance your camping experience. Versatility of Use: Opt for an air conditioning unit that is compatible with use as a heating pump. You will not always need to go out in your RV during the summer, as colder seasons might present an equally thrilling adventure. In such instances, it will be as important for you to stay warm as it is for you to stay cool during warmer months. Height of The Unit: The height of your air conditioning unit will have a direct impact on the height of your RV. Owners of Class A RVs need to pay particular attention to this feature. An RV air conditioner that dramatically increases the height of your RV could result in damaging the RV itself and significantly limit your packing options due to the available height clearance. Aerodynamic Properties: Aerodynamically designed air conditioners are best suited to reduce drag and increase fuel efficiency. They are also generally smaller in size. You, therefore, will be forced to make a trade-off between having a large and powerful unit with higher fuel consumption as well as drag or a smaller more fuel efficient unit that is less powerful. Budget Consideration: All other factors considered, your budget has the final say on the type of RV air conditioner to buy. When considering the cost implications of your purchase, you have to factor in much more than the buying costs. It is the running and maintenance costs that you have to consider carefully. Cost of Fuel: The running costs primarily include the cost of fuel needed to keep the air conditioner running for as long as you need it. These will be determined by the size of the unit, its power output, and the duration in which it is left to run. The larger the unit, the more powerful it is and consequently the more fuel it consumes. Also, the longer the unit runs, the more fuel is consumed. If size is not a feature you can compromise on, be sure to turn on the air conditioner only when you need it. Maintenance Cost: The maintenance cost will be as a result of wear and tear. To keep these costs to a minimum, ensure that your air conditioning unit is perfectly functional before you purchase it. Also, ensure that you have installed it properly. It helps to purchase an AC unit that you can easily maintain without the need of a professional. Purchasing a durable unit from a renowned brand will also help to reduce the frequency with which you need to replace the different components of your air conditioning unit. Of all the air conditioners we have reviewed in this guide, the Dometic B59516.XX1C0 Brisk II Polar Air Conditioner (15000 BTU) can rightfully be crowned as the best air conditioning unit for an RV in today’s market. We are particularly impressed by its ease of installation and maintenance. It is both lightweight and designed to take up the least possible space. Its high Btu rating of 15,000 gives it the capacity to effectively cool larger class-A RVs as well as small ones. Withstand even the harshest and hottest conditions by installing the best RV air conditioner. We hope these tips will come in handy when you are debating on a suitable air conditioning unit for your RV. Remember to match your unit of choice to both the size of the RV and your pocket. Stay cool while you ride out on new roads and adventures. LifestyleLRV.com is a participant in the Amazon Services LLC Associates Program, an affiliate advertising program designed to provide a means for sites to earn advertising fees by advertising and linking to Amazon.com.